My past experiences with day ticket waters is that they will generally be busy with anglers at prime times of the week and year, the fish will generally be on their guard as they shy away from angling pressure and anglers will be competing for prime positions which will see them gain a return for the day ticket money they’ve laid out. Taking these points into consideration I thought it only right to initially go off on a tangent and explain certain situations and areas I would be looking for when tackling day ticket water. Homework on a venue gives the angler a head start before he’s even set foot on its soil. Most day ticket lakes promote themselves via websites, check out its gallery and look at the fish pictures and in particular the backgrounds, this might give you an idea of any areas that standout and regularly crop up in photos. Check its location on Google earth, this will identify where certain winds will hit certain swims, this combined with an up to date weather check could prove invaluable. I’ve always found on the majority of day ticket waters that there will be the odd swim that hardly sees any angling pressure, a perfect and comical example of this is the swim called “no carp corner” I’d be in it like a shot. Any swim that is uncomfortable to fish, you know the one, the steep banked swim that isn’t wood chipped, you need bricks under your bed chair legs for a leveled nights sleep, I’ve actually done the above on a very busy day ticket water, it guaranteed me the same swim each weekend, it enabled me to create baited areas, I still proclaim that the area was a safe area for the carp. I caught rare visitors to the bank quickly. Job done. Right onto the rigs id take to any day ticket water in the country and be 100% confident using. When I first started carp fishing a good angler told me that rigs should be kept as simple as possible, he said that the more technical a rig is made the more there is that can go wrong with it. I will always remember that and that’s why I’ve chosen the most simplest of rigs, the knot-less knot. I am convinced that many high profile anglers use this rig day in day out and are very successful with it. I’ve chosen the rig for its versatility. I predominantly fish the rig as a bottom bait presentation. Tied with a curve shanked hook and with a supple un-coated braid there is no need for any shrink tube or line aligners, the hook will naturally turn and twist wherever it wants to without them. I prefer to fish the knot-less knot with a longer than average hair, especially with a bottom bait, I think it gives the hook more movement when being ejected by a carp. I am personally not one of these anglers that start jumping up and down in frustration if the hook is not neatly nestled in the center of the bottom lip. I personally like my hook anywhere within the internal area of a carp’s mouth, if I am unhooking the carp that’s goods enough for me. I choose to add a sinker to sink the supple hook link, that’s all its there for, nothing else. Id fish the rig on a lead clip set up with a core zero leaders and add either a stringer or funnel web bag to the hook to increase a good presentation on touchdown with the lake bed. Id also be confident of shortening the hook length and adding it to a solid bag of boilie or pellet. Id fish this rig on the harder areas of the swim e.g.gravel, clay or hard silt, it works best on clearer areas with no debris to hinder its effectiveness unless its added to a solid bag of course then its ok fished within the weedier areas of the lake. When fishing bottom baits on the hair I prefer a loose baiting presentation where i will scatter a kilo of similar baits over a large area, I will also create lines off the area in order to tempt a stray carp into the food trail. This is a baiting technique ill adopt with quite a few different rig presentations and not only the knotless knot. It’s a presentation that keeps the carp on the move, building up their confidence every time they pick up free bait. The knot-less knot is definitely one of the simplest and most effective rigs out there; it’s a refreshing change from the latest in vogue rigs. The second rig I have chosen combines both visual and food items on the hair, it also combines both buoyant and sinking baits creating a critically balanced combination. I am of course talking about the snowman rig. It’s a rig i’ve had great success on and prefer this particular rig when fishing the softer areas of the lake, the areas that are lightly covered with silt or debris. I fish the rig on a longer hook length of maybe 10 – 12 inches long coated braid; i’ve found the hook length will always push away from the lead clip system due to its stiffness and the balanced buoyancy of the baits. The snowman rig has always caught me the bigger residents of the lake, why? I haven’t got a clue, but im not complaining. I guess it comes down to confidence as a lot of angling situations do. The longer hook length works for big fish, it enables the hook link to travel further on the way in and on the way out when a carp picks up the bait. If you catch big carp on a certain rig then you expect to do so again and again. For the snowman rig I favour a long shank hook with a tungsten line aligner , the aligner ensure the hook lays flat on the lakebed and out of harms way until a pick up. It is evident from a palm test that the hook will turn, i am not sure that the hand and the carps mouth react in the same way, ill leave the hooking percentages to chance, I think we get done over a lot more than we would like to accept, I don’t think we’ll ever change that. When fishing with a yellow pop or artificial buoyant sweetcorn on the top of a bottom bait ill also loose feed a small amount of sweetcorn to mimic the visual aspect of the rig , its not a way of feeding the fish its purely there to ensure the carp comes into contact with a similar colour variation. With this rig being my number one choice for big fish the bulk of the free offerings are predominantly made up of whole boilies, I don’t proclaim to be an out and out big fish hunter, I like to catch targeted carp for there stunning looks but the boilie only approach does tend to sway the odds in the favour of the larger fish, It is my opinion that a heavily baited area of lets say particles will appeal to a larger group of smaller fish. I think the bigger fish are bigger for a reason, they know what’s good for them. 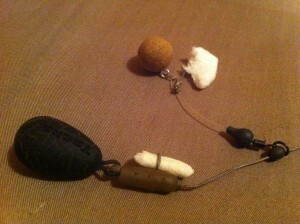 For those that know me, you will have seen that I am a big fan of fishing the chod “naked” style i.e. the rig section running freely on the mainline with no leader material needed. My association with Taska over the last 18 months saw me introduced to their baseline range, the range of tungsten beads and weighted components are right down the street of the naked chod angler. I’ve recently developed a tungsten chod bead that sits over the swivel eye on the chod section, it eliminates the need for putty and will critically balance a 14mm cork ball pop up. New to the Taska range is a drop off system I’ve been testing for over 6 months. The system ejects the lead if a fish weeds you up, it’s a neat little system that’s foolproof and I am sure it will be a big hit with chod / helicopter anglers. I fish the naked chod with a 17lb xline fluorocarbon mainline, I’ve yet to find a better flouro that has the casting and sinking qualities of xline, I use the lines weight as a hooking agent, this combined with the weed I am fishing over enables me to use a lighter lead of maybe 1-2 oz. I am not a massive fan of long choddies, I prefer a discreet 1.5 inch high chod section, and it’s a personal choice and one that I’ve adopted for a long time. I tend to fish critically balanced cork ball pop ups with choddies, tailoring the components to each individual hook bait, I cant stress the importance of checking the rig every time you attach a new hook bait, some cork balls have in the past had different buoyancy to each other due to the amount of base mix moulded around them. The lads at R.G. Baits, Rotherham are in the process of sorting this problem out for me with some identical hook baits matching the bottom bait recipe. My baiting patterns vary with chod fishing, if I turn up to a lake and the fish are showing I’ll opt for just the rig cast past them and drawn back over them, Id opt for a visual coloured high attract hook bait like a Nutrabaits pink plum and caproic cork ball. That’s the beauty of the chod, I don’t think it’s a cast anywhere rig , I think you still need to know roughly what your fishing over, feeling the lead down gives you some ideas. The rig is certainly a quiet way of presenting bait to showing fish. If I turn up to a lake and there are no signs of fish, I find an area where I think they will be or are likely to turn up and fish dull food bait cork ball pop ups. Fishing them as singles initially and then introducing a handful of free bottom baits and increasing the amount if I think it’s warranted. A lot of people think chod fishing is easy, it isn’t I cringe when I hear the phrase “chods for nods”; chod fishing still demands a very high level of watercraft and angling ability. But for the angler who perseveres and perfects it’s an awesome presentation. I hope some of you reading this will be able to pick out bits of information that are right for your own personal situations, everything I write isn’t going to suit everyone, angling is individual, the way it should be…..good luck.